Wrenched from the warm embrace of sleep, my consciousness was rudely awakened by my phone’s unholy call (aka alarm) at around 5AM. The room was cold and it was still dark outside, but my friends and I forced ourselves to wake up or else we’ll miss the sunrise experience at Angkor Wat! my sentiments exactly when forced to wake up early. but Angkor Wat! When researching a trip to Cambodia or specifically Siem Reap, Angkor Wat always comes out on the results pages, tantalising the intrepid with its majestic and mysterious countenance. Apparently, Angkor Wat is not to be missed when in Cambodia, so I was fine with this sunrise experience being included in the package offered to us by Ta Som Guesthouse. Preparations were rushed; we didn’t bother taking our morning bath at this point since we were returning to the guest house for breakfast anyway. A friendly driver was waiting for us downstairs with his tuktuk, proof of Ta Som’s great customer service. We arrived at Angkor Wat with a few minutes to spare before sunrise, which was at 6:08 AM that day. Now if we only have sunrise over Angkor Wat pictures such as this to go by, we would surely expect a peaceful morning jaunt – something that would lead to some meaningful internal reflections as one is surrounded by the mysticism inherent to any ancient place of worship. Seriously, the crowd at the temple was astonishing. It’s something one would expect at a famous singer’s concert. We thought we got there fairly early but the parking space was almost full already. Angkor Wat’s grounds is also very spacious but it was teeming with people. Apparently, the sunrise here is very popular, especially its reflection on the moat surrounding the temple. I saw tourists and photographers there lining up with their tripods and long lenses eagerly waiting to get the money shot. wall of people waiting for the sunrise over Angkor Wat. Say what?! I kinda wilted at that point. Waking up early was always a challenge for me and to think I had to rise at the crack of dawn only to be greeted by a seething mass of humans that completely banished the solemnity and mystique of Angkor Wat… All I could think of was I wanted to get out of there and back to my bed! I already expected there would be a crowd there because Angkor Wat was famous after all, but my expectations were dwarfed by the reality. And I guess I really just can’t handle crowds that well. Thankfully, after minutes of dodging eager tourists, children and touts (for there were lots of touts!) the sun decided to grace us with its presence. I focused and did my best to drown out the crowd and noise around me. I concentrated on the temple spires as they were slowly bathed in the golden rays of the sun coming up behind them. The dark skies burst into all shades of orange and purple. For a few moments, the temple’s silhouette and the shadows dancing on its carved walls gave me the sense of mystery and awe I was desperately seeking. For a few moments, I was lost in the temple’s spell, the echoes of its hallowed halls calling out to me. For a few moments, it was beautiful and ethereal. Then a child screamed for his parents. That promptly shattered my reverie. Sigh, that was it. The sky turned bluer as the sun continued its climb. The purple and orange lights became wisps in the horizon, a reminder of just how fleeting life’s pleasures can be. The three introverts (that’s us) hightailed it out of there! 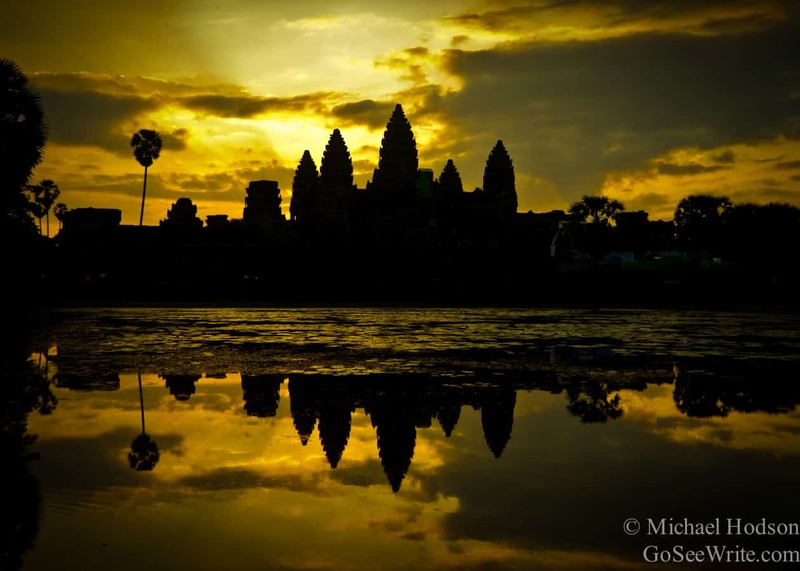 So how do I review my Angkor Wat sunrise experience? It was beautiful and I’m glad I experienced it. Never doing it again though. Too many people! This is the crowd I like.